The city’s first bike lane will no longer be the city’s worst bike lane. 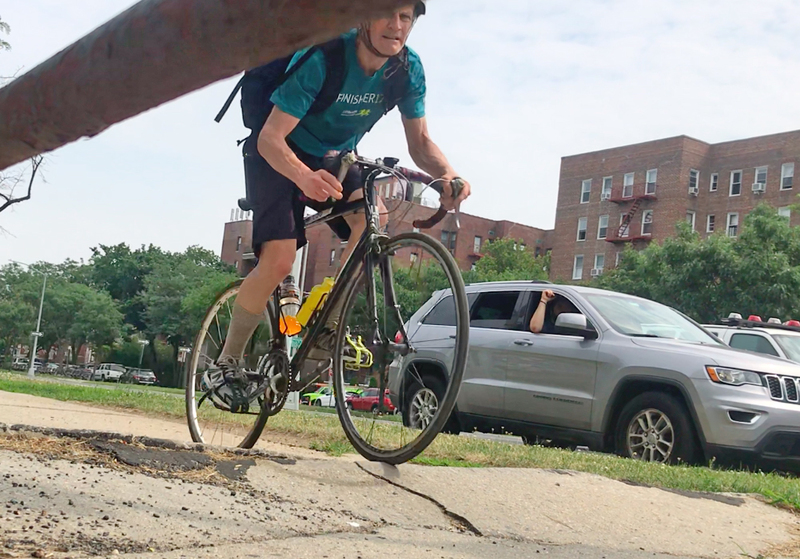 The Parks Department will begin fixing the bike path on Ocean Parkway between avenues R and X this spring, thanks to a $1-million allocation from City Council Member Mark Treyger and $500,000 each from Borough President Eric Adams and the Council itself. Treyger’s contribution represents 20 percent of his entire discretionary budget — an indication of how seriously needed and overdue the project is. The work will also include new benches and other amenities. The Ocean Parkway bike path runs roughly between Park Circle in Windsor Terrace to Coney Island on an island between the southbound lanes and the southbound service road. The Olmstead and Vaux design for the European-styled boulevard did not initially include a separate lane for bikes, but in 1894, the wide pedestrian island was split to accommodate cycling, which was having its first major boom. Many cycling websites have embraced the path’s history, but have also, for years, bemoaned its lack of maintenance. The southern part of the bike path is frequently mocked on Twitter. It is unclear why the Parks Department allowed the path to fall into such a poor state of repair. There may be a jurisdictional issue, however: There have been hundreds of alls to 311 to report broken sidewalks along Ocean Parkway since 2010 — but every one of them was referred to the Department of Transportation, not the Department of Parks and Recreation, city data show. Ocean Parkway has a great stand alone bike lane, unfortunately it does just stop, and it’s all ripped up the further south you go. This path needs much more than repaving. When riding this you have to be constantly at alert for both left and right-turning cars crossing your path at high speed. Drivers on the cross streets also frequently stop blocking the path. People walking don’t stick to the part of the path marked for walking. The ramps are generally built like pedestrian ramps and are steep and jarring at cycling speed, even when the base is flush with the road bed, but there’s more often a lip of an inch or two as well. The slip roads south of Ave Z and Shore Parkway should be closed or reconfigured. It’s a really outdated design. Totally agree. There needs to be signal phasing put in so that bicyclists and pedestrians go first. And a clear demarcation so that cyclists and pedestrians share the path but don’t trample each other. Where is #VisionZeroNYC? Does each city council member have $5M in discretionary money each year? Such a shame that confusion over whether a bikeway is under Parks Dept. or Dept. of Transportation would keep it in disrepair for years. Side note: from experience it seems that issues that fall under the domain of Environmental Projection get the fastest repair response. There was glass on the sidewalk and the road from a broken bus stop shelter. A call to 911 yielded the information that the police did not care about the dangerous condition would not address the broken glass. A call to 311 referred the call to the Dept. of Environmental Protection (not MTA, not DOT) and the glass was removed from the sidewalk and the road and a new glass panel installed on the bus stop shelter in less than 18 hours. Suddenly no one is responsible for anything. ^^ this. The design is so dated as to be fundamentally unsafe. If I’m riding around here, I ride on north-south streets further east; Argyle/East 13th northbound, or Rugby/East 14th southbound. If I must use Ocean Parkway, I simply ride in the rightmost lane of the main road (not the service road.) This triggers some crazy entitled-motorist-lash-out, sadly. Or I just use Bedford, though I prefer the stretch of Bedford south of Glenwood Road (all the way through to Emmons) to the stretch north of it. There’s left turning traffic from the adjacent service road, right turning traffic from Ocean Pkwy and left turning traffic from Ocean Pkwy; that coupled with cross traffic often blocking the lane, broken and raised path, and oblivious peds. Describing riding on Ocean Pkwy bike path as dangerous does not begin to describe it. I usually ride through Ditmas Park and prefer Saturdays when the traffic in that area is much lighter. I echo the comments that fixing the pathway requires adjusting traffic control devices to really make it safe to ride on. did they ever fix any of the slip lanes? I take bedford over the ocean parkway path. south of the foster it is pretty quiet. Biking Ocean Pkwy southbound, I tried the designated path on the malls. For a few blocks. Once. Ever since, I use the service road. Northbound, the service road is the obvious choice. As to the malls being in poor repair, hey! They’re not for cars. Who cares? Here’s a head-scratcher: Eastern Pkwy uses essentially the same configuration as Ocean Pkwy and while it’s far from the most pleasant bike path I’ve used, it’s very … adequate. Lost on me is why one works — at least for me — and the other doesn’t. I don’t like the service roads on Ocean Parkway either. There’s a stop sign at the end of darn near every one of them; that’s no way to run a railroad. Totally agreed that Eastern Parkway works a lot better. Maybe it’s just that it’s a smaller, quieter road, overall, rather than *the major* east-west artery in that part of Brooklyn? Here’s why so many cars block the bike path. Ocean Parkway is approximately 150 feet wide. The red clearance signal (red in all directions) is supposed to permit a car that entered the intersection during the 3 second long yellow light to proceed completely across the intersection before cross traffic begins. NYC’s red clearance signal is 2 seconds long regardless of the cross street width. A car traveling a legal 20 mph will travel 60 feet in 2 seconds. That will place the car’s front bumper at the service road and its body smack in the middle of the bike path. The cars on Ocean Parkway will have a green signal and will not have seen the cross traffic approaching. The cross traffic has to come to a halt before crossing the threshold onto the main roadway. One cure is pretty simple. Extend the red clearance period to 5 seconds for the east/west transition from green to red. This would permit cars beating the light enough time to clear Ocean Parkway, which is the purpose of the red clearance. In the 40th District, covering parts of Flatbush, Prospect Lefferts Gardens, and Ditmas Park, incumbent Mathieu Eugene faces challengers Jennifer Berkley, Brian Cunningham, and Pia Raymond.